AmazonFresh - Free same-day and early morning delivery on orders over $35 of more than 500,000 Amazon items, including fresh grocery and partnered local products. Arizmendi Bakery - Awesome takeout pizza, excellent breads. Thin-crusted sourdough pizza is crammed with different toppings daily. While the bakery makes a variety of breads each day, the sourdough bread is good enough to come back for. Rolls, cheese, yogurt and pastries--including chocolate cake--are available to make the start of your day a little sweeter. Bi-Rite Market - 3639 18th Street, San Franicisco. Full service market: baked goods, cheese, grocery, meat and fish, prepared foods, produce, sandwiches, ice cream, wine. Boudin Bakery - San Francisco sourdough French bread, panettone and artisanal breads. Bristol Farms - High-end grocery store. Avedano's - 235 Cortland Ave., SF, (415) 285-6328. Belcampo Meat Co. - 1998 Polk St., SF, (415) 660-5573. Bi-Rite Market - 3639 18th St., SF, (415) 241-9760. Fatted Calf - 320 Fell St., SF, (415) 400-5614. Marina Meats - 2395 Chestnut St., SF, (415) 673-6700. Niman Ranch - Niman Ranch produces the finest tasting meat in the world by adhering to a strict code of husbandry principles. Livestock are humanely treated, fed the purest natural feeds (with no animal by-products or waste), never given growth hormones or sub-therapeutic antibiotics, and raised on land that is cared for as a sustainable resource. In other words, raised with care, naturally. Prather Ranch - Ferry Building Marketplace, SF, (415) 391-0420. Candy Store, The - Located just off upper Polk Street in Russian Hill, The Candy Store is San Francisco's premier candy boutique, offering a wide range of sweets, sours, gummies, gumballs, licorice and chocolates. It carries hard to find nostalgic items from long-established candy makers, as well as the latest products from new artisan confectioners. Come in for a pound of licorice wheels to munch on at the office or for a gift box of the finest French caramels. Contact: Liana. Apothecarium - Broad selection of medical cannabis, including flowers, edibles, topicals, and concentrates. Barbary Coast Dispensary - Provides a wide range of products including flowers, pre-rolls, premium vape cartridges, concentrates, edibles, topicals, and accessories. Also, its Barbary Coast Dab Bar and Lounge is a safe, clean, and comfortable space where you can relax and enjoy recreational cannabis and hang with family and friends. Bloom Room - Cannabis flowers, concentrates, edibles, and tinctures. Grass Roots - Marijuana home delivery service and in-store pickup of fresh flowers, pre-rolls, vape accessories, edibles, and more. Green Cross, The - Offers many strains, medicated edibles and smoking alternatives directly and discreetly to your home. Cannabis, pre-rolls, edibles, concentrates, tinctures, pipes, vaporizers, topicals, and more. Harvest - Curated cannabis products. Each Harvest dispensary features a members-only lounge. Highwayz - A medical marijuana collective delivering to San Francisco and parts of the Bay Area. Sparc - Products range from home-grown flowers to the famous Dolores Park truffles. While you can’t smoke on sight, you can take advantage of the vape lounge. Center for Urban Education about Sustainable Agriculture (CUESA) - Dedicated to cultivating a sustainable food system through the operation of the Ferry Plaza Farmers Market and its educational programs. CUESA's educational programs include Market to Table events, farm tours, weekly electronic newsletter, lectures and panel discussions, educational displays, and more. Cheese Boutique - This San Francisco variety food shop has survived and thrived for 20 years in the looming shadow of the Inner Sunset's mighty Andronico's. Inside, step cautiously, for two strides in any direction will walk you into a shelf full of exotic olive oils, gourmet preserves, fine sandwich condiments, fresh baguettes, local honey, English tea, dried nuts, organic Turkish figs, store-made hummus, or the small selection of wine. By the register, the glass display counter holds pâtes, hams, olives, and over 100 imported cheeses, all sliced to order and sold by the pound. Sandwiches are made on the spot, and any of eight coffee roasts from San Francisco's Capricorn Coffees can be purchased whole-bean or ground. The Cheese Boutique's prices are dramatically lower than those of the supermarket a block away, and after just a few visits, owners Rick and Nada Malouf will know your name. Cheese Plus - Finest artisan cheeses and fine culinary products including Northern California artisan produced charcuterie, chocolate, specialty condiments, oils and vinegars, and our own house made sandwiches, salads, and spreads. Cowgirl Creamery - Supports and promotes artisan cheesemaking, offering over 200 cheeses from all over California, America and Europe through their website and retail locations. Ciao Bella - One Ferry Building, SF, (415) 834-9330. Indulgent collection of gelato and sorbet. CocoaBella Chocolates - The ultimate chocolate lifestyle shop presented in an old-world European fashion; warm wood cabinets and marble slab counters filled to the brim with delicious chocolates of all shapes and sizes. Eat Drink SF - San Francisco's annual (August) food, wine and spirits festival. Experience tastes and flavors from the Bay Area's finest chefs, mixologists, brewers and wine experts in an epic foodie festival weekend presented by the Golden Gate Restaurant Association. Far West Fungi - The Garrone family is passionate about edible fungi. 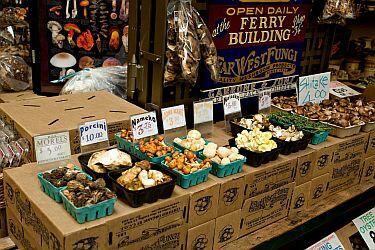 For more than 25 years they've been dedicated to the growing, distribution and marketing of organic specialty mushrooms. Fatted Calf - A deli-like sanctuary of all things meat. A cross between a butcher shop and a market with some craft beer and wine thrown in the mix, Fatted Calf is primed to be your source for a meatloaf sandwich, beer sausages and a custom-brewed house beer or two. The big, glass-walled walk-in all the way back (under the wall of white vintage stove tops) showcasing a hanging pig, lamb and side of beef-all poised to be custom butchered on the fly. Ferry Building Marketplace - A people's marketplace serving residents and travelers alike. Located within the historic Ferry Building at the foot of Market Street, shops large and small celebrate food in all its forms, offering everything from artisan cheeses to the freshest of local fish. Restaurants and cafes serve cuisine representing the quality and cultural diversity of San Francisco's best chefs. See Merchant's List. Ferry Building Night Market every Thursday night, 4:00 p.m. to 7:00 p.m. Ferry Plaza Farmer's Market - A California certified farmers market operated by the Center for Urban Education about Sustainable Agriculture (CUESA). The market is open two days a week - Tuesdays and Saturdays. The large Saturday market is held both in front of the Ferry Building on the Embarcadero and on the rear plaza overlooking the Bay. On Tuesday, the market spills out of the Arcades onto the Embarcadero sidewalk. The markets offer produce and flowers from small regional farmers and ranchers, many of whom are certified organic. A wealth of other products include regional artisan specialties such as breads, cheeses and jams. Tuesday: 10am-2pm; Saturday: 8am-2pm. Ferry Plaza Wine Merchant - A classic, hands-on, service-oriented shop for buying, tasting, and learning about wine. The nearly 3,000 square foot shop carries smaller production wines from around the world, as well as everyday, high-quality labels. There is a strong but selective emphasis on California and other American wines; wines from great French, Italian and Spanish producers; offerings from new regions - such as in New Zealand and Australia; and less widely recognized favorites from Germany and Austria. Icons help shoppers easily identify dry and sweet wines, organically grown wines, etc. Seated at the 20-seat, dark wood wine bar, visitors can taste from selections that change daily. Fiona's Sweet Shoppe - Mouthwatering selection of English, Scottish and other wonderfully scrumptious sweets from around the world. Hard candy, soft candy, chewy candy, toffeed candy, chocolate candy. Flour + Co - Baked goods made from all natural and often organic ingredients. Gelateria Naia - 520 Columbus Avenue (between Powell & Stockton), SF, (415) 677-9280. Sample the traditional Gianduia or Zabajone, or try one of Gelateria Naia's own unique creations like Cioccolato Mortale or Foresta Nero. Gelato Classico - 576 Union St. (at Stockton St), SF, (415) 391-6667. The space is tiny but the flavors are fantastic -- and the setting in North Beach can't be beat. Golden Gate Meat Company - Fresh beef, natural and organic beef cut to your specifications, pork and natural pork, lamb, veal, smoked meats, wild game, poultry, sausages, luncheon meats, cheeses, fresh fish, and other prepared foods. Located in Ferry Plaza, San Francisco. Graffeo - One of North America's oldest artisan coffee roasters and remains a family-run company passed on down through generations. Founded in 1935 on the streets of San Francisco's Italian culinary capital, North Beach: 735 Columbus Ave., San Francisco, CA 94133. PH: (415) 986-2420 or (800) 222-6250. Hog Island Oyster Company - Cultivating and delivering oysters. Humphry Slocombe - Ice cream. La Boulange - French bakery. This local favorite offers what must be the best cannelles (an eggy, cinnamony pastry) outside of Paris. Try, too, their version of flan, which is a smooth custard baked in a pastry shell. Le Beau - Fresh local produce and breads; meat, fish, dairy and deli foods. Local Mission Market - 2670 Harrison S. (bet. 22nd and 23rd Sts. ), SF. Locally-sourced and handmade market. Beyond the bounty of exclusively and directly-sourced Central and Northern Californian fruit, vegetables, meat, fish, oil, vinegar, rice and beans, it crafts, packages, and labels every bread, pasta, jam, pickle, cracker, condiment, sausage, cured fish, and more on-site and by-hand. Lucca Ravioli - Imported specialties from Italy and around the world, such as: wines, cheeses, cold cuts, seafood, pastas, olive oil, desserts, etc. Marin Farmers Market - Operates seven markets in the Bay area, four in Marin County (Sunday and Thursday Civic Center, Novato and Fairfax) and three in Alameda County (Grand Lake-Oakland, Newark and Hayward). Five of our markets operate year-round (Sunday and Thursday Civic Center, Grand Lake-Oakland, Newark and Hayward) and two of our markets operate seasonally (Novato and Fairfax). Mission Community Market - A community marketplace that takes place every Thursday, rain or shine, from 4pm til 8pm on Bartlett Street between 22nd and 21st Streets in the Mission district of San Francisco. Mitchell's Ice Cream - Featuring 40 flavors daily, still using 16% butterfat in all of their ice cream, along with the finest ingredients from local sources, from across the country and from around the world. Mr. Holmes Bakehouse - Creative interpretations of French pastries: croissants, brioche donuts, a towering Cruffin, torched meringues, and a surprisingly delicious, soon-to-be-signature California Croissant, which is a croissant stuffed with salmon, nori, ginger and wasabi. 1042 Larkin Street (bet. ost and Hemlock Sts. ), (415) 829-7700. Oaktown Jerk - Oakland, California's finest artisan beef jerky. Peet's Coffee and Tea - Coffee and tea entrepreneurs. Porcellino - Deli and restaurant. Offers a full line of salumi from Boccalone plus select complementary goods such as pasta, olive oil, sauces, and condiments and wine. Prather Ranch Meat Company - 1 Ferry Building, Shop #32, SF, (415) 391-0420. Raises, distributes & sells fine quality, humanely-raised, flavorful meat products. Raff Distillerie - At 990 13th St. (on Treasure Island), S.F., (888) 228-6636. Providing a new local line of absinthe and gin. Rainbow Grocery - San Francisco Bay Area collective dedicated to earth friendly food products, and an organic future. Real Food Company, The - One of the original neighborhood natural food stores. Two San Francisco locations. Recchiuti Confections - Chocolates. Located at San Francisco's Ferry Building. Richart Design et Chocolat - 393 Sutter Street, SF. An ultra-pricey, ultra-swank chocolate boutique where you can shop by flavor family (Herbal, Spiced, Roasted), by occasion (Celebrate, Birthday, Wedding), or by collection (Joyous Memories, Simply Dark). The chocolates are visually stunning and of top quality. Ritual Coffee Roasters - Uncompromising selection of green coffee; unflagging attention to roasting; rigid freshness standards, barista training camp. Ritual is entrenched in the uber-geeky coffee network that stretches from the underground city in Seattle, through Milwaukee, all the way to Oslo. Safeway - 15 Marina Boulevard, S.F. (415) 563-4946. Salumeria - A deli and larder that marries the traditions of the old world with the food culture of San Francisco. Taking inspiration from the artfully crafted cured meats of Italy and integrating these recipes with local ingredients, Salumeria aims to showcase a selection of house-made salumi and prosciutto with a Northern California sensibility. Daily offerings of sandwiches, salads and antipasti; and a curated selection of cheeses, oils, honeys and fresh made pasta. Our shop functions as both a lunchtime destination and an after work grocery stop. San Francisco Cheesecake Company - Hand made cheesecakes from scratch: real cream cheese, butter, vanilla bean, eggs and sugar. San Francisco Food Tours - Chinatown and North Beach food walking tours. San Francisco Herb Company - Wholesale prices on the highest quality culinary herbs and spices, extracts, teas, dehydrated vegetables, nuts, seeds, botanicals, essential oils, potpourri ingredients and fragrance oils. Sea Forager - Fresh, sustainable, delicious seafood and walking, foraging, fishing tours of the San Francisco Bay Area brought to you by Kirk Lombard. Sight Glass - An independent, sibling-owned coffee company in San Francisco. Small Foods - Locally produced, healthy and convenient food and beverages in an inspiring store setting. Located at 522 2nd Street, in the Southpark neighborhood, two blocks north of AT&T ballpark. Smart & Final - Combines the high quality fresh produce of a farmer's market, the low prices of a discount grocer and the large club size products of a traditional club store. Smitten Ice Cream - Made to order ice cream from the freshest seasonal ingredients. Sur la table - Finest cookware, dinnerware, cutlery, kitchen electrics, bakeware and more. Its cooking class program is one of the largest in the nation. Trader Joe's - Specialty grocery stores. Trader Joe's has over 200 stores in Arizona, California, Connecticut, Delaware, Illinois, Indiana, Maryland, Massachusetts, Michigan, Missouri, Nevada, New Jersey, New Mexico, New York, Ohio, Oregon, Pennsylvania, Virginia and Washington. Union Street Produce Company - 801 Union St. ((between Mason St & Taylor St) SF, (415) 928-2611. Fresh fruits and vegetables daily. Whole Foods Market - Natural and organic foods retailer. Several San Francisco Bay Area locations. Wise Sons - Jewish delicatessen. Three locations: 3150 24th Street (at Shotwell St.), 736 Mission St. (bet. 3rd and 4th Sts. at Contemporary Jewish Museum), and 1 Ferry Builing (at Ferry Building Farmer's Market). This webpage last updated on Sunday, January 6, 2019 2:46 AM.